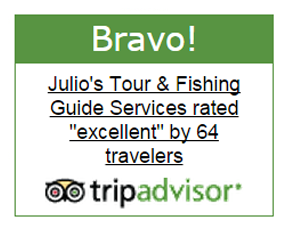 Welcome to Julio’s Guide Service! Zihuatanejo and its sister city of Ixtapa are located along the beautiful Pacific Coast of Mexico. Downtown Zihuatanejo is called “El Centro” and is a quaint fishing village that sits on a picturesque bay. There are many excellent restaurants and unique shops to explore. You will find the local people very warm, friendly and helpful. I was born and raised here and it remains home to me, my wife and three great children. I have fished the surrounding waters all of my life and know the area very well. I will work very hard to make your experience in our area a very memorable one. I’m a member of The Billfish Foundation and practice the use of circle hooks and “catch, tag and release”. My main goal is to turn your day of “fishing” to a great day of “catching”. A 26’ custom Super Panga powered by a 75 hp Yamaha outboard motor and cruises at 20+ knots. She has a maximum capacity of 4 people for fishing, a small semi-private head, 2 fighting chairs, two 15’ outriggers, two cushioned benches for your comfort and is covered for shade to protect you from the sun. On board you’ll find VHS marine radio, cell phone, life jackets and an ice chest for your refreshments.